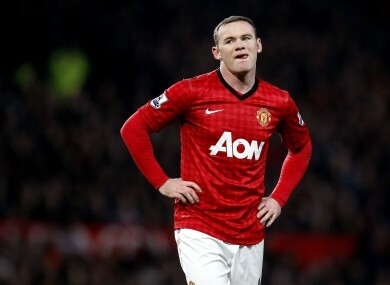 Wayne Rooney is understood to be unhappy with recent comments made by United manager David Moyes. HE HAS NOT been in the job for long, but David Moyes has already made his first major mistake as Manchester United manager. United striker Wayne Rooney is understood to be unhappy with Moyes, for effectively, ill-advisedly saying what most people are thinking. When quizzed by journalists on the importance of Rooney recently, Moyes commented: “Overall, my thoughts on Wayne is that if for any reason we had an injury to Robin van Persie we are going to need him and I want as many options as possible.” He went on to explain how “Manchester United isn’t about Wayne” and said they would reassess Rooney’s position at the club in 12 months’ time. While Moyes has continually said he wants to keep Rooney at Manchester United, insisting that the striker is “not for sale,” these most recent comments are hardly conducive to this aim. And unsurprisingly, the striker is reportedly furious as a result of what his manager has said, with several media outlets claiming that the 27-year-old’s Old Trafford career is now close to an end. Rooney’s predictably angry reaction has prompted critics and fans to speculate as to why Moyes chose to make the comments in the first place. Was the new boss being disingenuous when he suggested the club were intent on ensuring Rooney stays at Old Trafford for the foreseeable future? Is he, in reality, seeking to quicken the England international’s exit from the club? It’s not a theory that can be easily dismissed, as from Arsene Wenger’s supposed inability to see any questionable refereeing decisions that benefit his club, to Jose Mourinho’s constant paranoia that football’s governing bodies hold a pro-Barcelona bias, managers’ interviews have increasingly lacked credibility and seemed dictated by ulterior motives in recent years. However, perhaps the opposite is the case, and everything Moyes has said up to this point has been 100% honest. Certainly, he has form in this regard, as while most managers are usually unwilling to ever criticise their players publicly (Brendan Rodgers, for instance, was reluctant to immediately condemn Luis Suarez after he infamously bit an opponent), Moyes demonstrated no such hesitation in openly hammering Marouane Fellaini last year. Even though the Belgian international’s headbutt on Ryan Shawcross during a game last season was not seen by the officials, the then-Everton boss described his player’s behaviour as “unacceptable” and dismissed suggestions that they would appeal his subsequent three-match ban. And although such candidness is laudable to an extent, it may not go down so well in the dressing room of such a high-profile and ego-driven club as Manchester United. Nevertheless, irrespective of whether Moyes is being genuine or not in his claims of wanting to keep Rooney, his aforementioned remarks on the player seem equally baffling either way. If he really wants to sell the England star, then clubs will presumably point to the fact that United supposedly deem him to be inessential in a bid to negotiate a lower price for his services. Conversely, if Moyes does in fact want to keep Rooney, downplaying his importance seemingly serves little purpose other than to unsettle a player whose confidence is notoriously erratic at best. It is no coincidence, for example, that he enjoyed his best season for United directly after Cristiano Ronaldo’s departure, ostensibly owing to the greater level of responsibility that was afforded to him. One other explanation is that by criticising Rooney, Moyes hopes to motivate him to aspire to greater heights as a player, as despite United winning the title comfortably last year, the striker often looked strangely subdued and even short of fitness at times. Therefore, his controversial comments were in truth hard to argue with, even if they seemed a little unwise and all too honest, especially given that the club are experiencing potentially their most vulnerable period for years following the departure of Alex Ferguson. Moreover, despite their domestic dominance last year, United are currently struggling to attract the marquee signing that has been promised. Thiago turned them down in favour of Bayern Munich, and Barcelona appear reluctant to sell Cesc Fabregas. While Rooney, who Sven-Goran Eriksson once compared to a young Pele, has not turned into the truly great player that many had hoped, he is still surely worthy of a first-team spot ahead of potential alternatives such as Shinji Kagawa or Javier Hernandez. And his record of 141 goals in 277 league appearances for United, while not exactly Van Persie-esque, remains impressive enough. Furthermore, Rooney’s mere presence in the side is not a factor that can be underestimated. Just as was evident when Barcelona were without Messi in the Champions League last year, teams can suffer psychologically when one of their star players is absent. In addition, while he embraced the increasingly multi-cultural nature of the Premier League over the years, a defining aspect of Alex Ferguson’s managerial style was that he always ensured his teams possessed a British/Irish spine. Similarly, the Premier League’s second most successful team in recent years, Chelsea, have seemingly pursued a comparable policy by continually giving prominence to the likes of John Terry and Frank Lampard. Arsenal, by contrast, have never really been the same since players such as Sol Campbell, Martin Keown and Ashley Cole left without being adequately replaced. With Rio Ferdinand approaching retirement, and Rooney now seemingly eager to leave, United risk losing their influential fulcrum (although others such as Phil Jones, Chris Smalling and Tom Cleverley could conceivably fill the gap should they fulfill their potential). All of which suggests that, whatever his intentions, David Moyes was misguided in speaking so frankly about his wantaway striker, as at least at the moment it seems, Manchester United need Wayne Rooney more than Wayne Rooney needs Manchester United. Email “Opinion: Why David Moyes was wrong to openly downplay Wayne Rooney’s importance”. Feedback on “Opinion: Why David Moyes was wrong to openly downplay Wayne Rooney’s importance”.